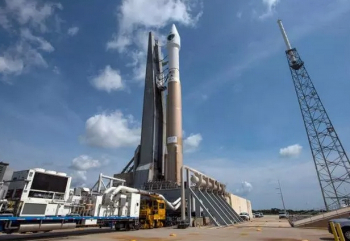 The United States Air Force is continuing to replenish its fleet of Global Positioning System navigation satellites Wednesday via the successful launch of the tenth Block IIF spacecraft atop a United Launch Alliance Atlas V rocket. Liftoff from Cape Canaveral was on schedule at 11:36 local time (15:36 UTC) – at the start of a nineteen-minute window. The GPS IIF-10 satellite which launched Wednesday was the seventieth spacecraft to be launched as part of the Global Positioning System (GPS) constellation and the tenth in the Block IIF series that began launching in May 2010. Block IIF, which consists of twelve satellites, is an interim series of filling the gap between the older Block II Replenishment (IIR) satellites and the next-generation GPS III spacecraft. The Block IIF satellites, which are constructed by Boeing, each have a mass of 1,630 kilograms (3,590 lb) and are designed to operate for at least twelve years. Originally at least 33 spacecraft had been planned, with this being reduced to twelve and later nine or ten before increasing back to twelve in 2006. 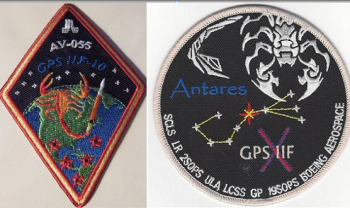 The first series of GPS satellites to make use of the Evolved Expendable Launch Vehicles (EELVs) – United Launch Alliance’s Atlas V and Delta IV rockets – instead of the older and less powerful Delta II, GPS IIF satellites use the rockets’ increased performance to facilitate deployment directly into their operational medium Earth orbits. The earliest GPS satellites, an experimental series now known as Block I, were launched using surplus Atlas missiles between 1978 and 1985. Eleven spacecraft were launched of which one failed to achieve orbit. After demonstrating the concept with Block I, the US Air Force began to deploy the operational Block II satellites using Delta II rockets. The first launch took place in 1989, on the Delta II’s maiden flight. After nine launches the Block II was superseded by the enhanced Block IIA, with a further nineteen spacecraft reaching orbit. Block IIA deployment completed the initial GPS constellation with new launches switching to replenishment using the Block IIR spacecraft. The first Block IIR satellite, GPS IIR-1, was lost in a January 1997 launch failure, however twenty subsequent satellites were deployed successfully. The last eight spacecraft used an upgraded IIRM configuration and the final launch came in August 2009. Following Wednesday’s mission, two GPS IIF satellites remain to be launched. GPS IIF-11 is scheduled to lift off in late October with GPS IIF-12 slated for launch in early February next year. Both of these launches will use Atlas V rockets. The first Block III satellite, GPS IIIA-1, is expected to ride a Delta IV rocket into orbit no earlier than the first quarter of 2017. The GPS constellation is divided into six orbital planes, designated A to F, each of which contains four fully operational satellites plus several older spacecraft serving as backups and reserves. The GPS IIF-10 satellite will join Plane C of the constellation, taking over slot 3 from the USA-177 satellite which launched atop a Delta II rocket in March 2004. Still fully operational but past the end of its design life, USA-177 – which is also designated GPS IIR-10, will be moved to a reserve slot in the same plane. Since the number of GPS satellites that can be in service at one time is limited to 31, the USA-126 spacecraft – also known as GPS IIA-17 or GPS II-26 – will be retired from service. 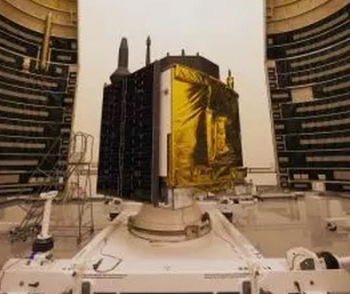 This satellite, which was launched in July 1996, is one of the oldest operational spacecraft in the constellation. 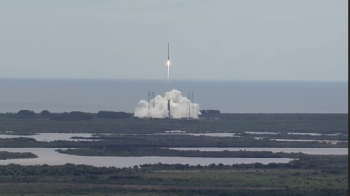 GPS IIF-10 lifted off from Space Launch Complex 41 at the Cape Canaveral Air Force Station – the same launch pad from which NASA’s New Horizons spacecraft departed for Pluto in 2006. The launch pad, which was originally built in the 1960s for the Titan IIIC rocket, formed part of the Titan Integrate-Transfer-Launch complex along with the nearby Launch Complex 40 – which is now used by SpaceX for the Falcon 9 rocket – and a shared Vehicle Integration Building (VIB) that has since been demolished. The first launch from SLC-41 occurred on 21 December 1965, followed by nine more Titan IIIC flights. During the mid-1970s the complex was used for the Titan IIIE, which incorporated the high-energy Centaur upper stage into the Titan vehicle, enabling it to launch the Viking missions to Mars, the Voyager missions to the outer planets and the Helios probes that studied the Sun. Following seven Titan IIIE launches, the complex fell out of use until it was rebuilt for the Titan IV which made its maiden flight from the facility in June 1989. Of the ten Titan IV launches from pad 41, all but one used the Titan IVA version of the vehicle. The Titan IVA made its final flight from SLC-41 in August 1998, failing to achieve orbit after an electrical fault resulted in the loss of the rocket’s guidance system. This was the first of three consecutive launch failures for the Titan IV, which also included the last Titan launch from SLC-41; which used a Titan IVB in an attempt to orbit a Defense Support Program missile defence satellite. Following the completion of its role in the Titan program, Space Launch Complex 41 was converted for the Atlas V.
The Fixed and Mobile service towers at the pad were demolished to make way for the Atlas’ clean pad approach and a new Vertical Integration Facility (VIF) was assembled close to the launch pad. 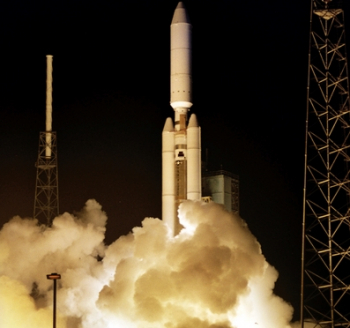 Following conversion, the first use of the complex was the Atlas V’s maiden flight in August 2002. Wednesday’s launch is the forty-fifth Atlas launch from SLC-41 and the seventy-second launch from the pad overall. The rocket that performed Wednesday’s mission was Atlas AV-055. 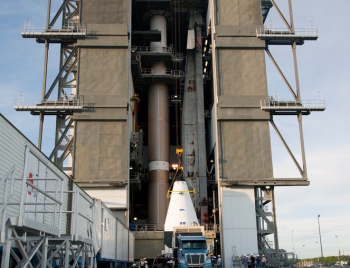 An Atlas V 401, AV-055 consists of a single Common Core Booster (CCB) first stage powered by a Russian-built RD-180 engine and a Single-Engine Centaur upper stage propelled by an Aerojet Rocketdyne RL10C-1 engine. The CCB is fuelled by RP-1 propellant, using liquid oxygen as an oxidiser, while the Centaur is cryogenically-fuelled burning liquid hydrogen and liquid oxygen. AV-055 is rounded out by a four-meter payload fairing; to deploy GPS satellites the Atlas uses a Long Payload Fairing (LPF) – which, despite its name, is the smallest of the six fairings available for the Atlas V.
Originally developed for the Atlas I rocket, the LPF served as an alternative for larger spacecraft that could not fit in the Medium Payload Fairing that was standard at the time. Over time, the LPF became the standard and the Medium Payload Fairing has since been discontinued. Two new lengths of four-meter fairing, the Extended Payload Fairing (EPF) and Extra-Extended Payload Fairing (XEPF), have been introduced for larger payloads while three lengths of five-meter fairing are also available – although the largest has never been used. The Atlas’ 401 configuration does not make use of solid rocket motors to augment the first stage’s thrust. Depending upon payload requirements the Atlas can fly with up to five Aerojet AJ-60A solid motors, however the relatively small GPS spacecraft do not require this additional performance. 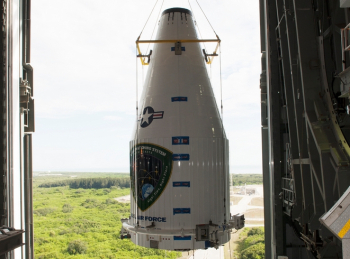 AV-055 was assembled in the Vertical Integration Facility adjacent to Space Launch Complex 41; rolling to its launch pad atop a mobile launch platform Tuesday. Wednesday’s launch began with the RD-180 engine igniting 2.7 seconds ahead of the planned launch time. Liftoff itself occurred when the rocket’s weight exceeded its mass – this usually happens about 1.1 seconds after T-0. 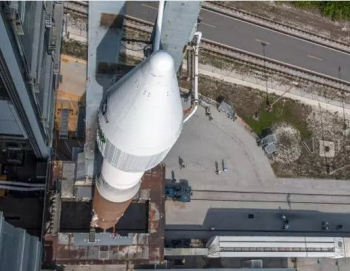 The Atlas began a series of pitch and yaw manoeuvres beginning 17.2 seconds into the flight to attain a launch azimuth of 45.8 degrees and the proper attitude for its ascent to orbit. Seventy-eight and a half seconds after lifting off the vehicle achieved a speed of Mach 1; the speed of sound; passing through the area of maximum dynamic pressure 11.7 seconds later. Four minutes, three and a half seconds after lifting off, Atlas AV-055’s first stage engine – approaching propellant depletion – cut off. 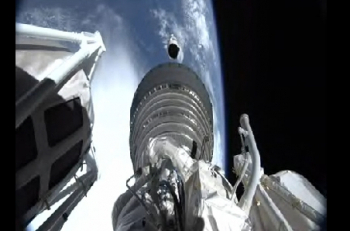 An event designated Booster Engine Cutoff, or BECO, this marked the end of first stage flight with the spent Common Core Booster separating from the rocket six seconds later. The Centaur began its prestart sequence, igniting its RL10 engine ten seconds after staging. Eight seconds into the Centaur’s first burn, Atlas jettisoned the payload fairing that encapsulated GPS IIF-10 for its journey through the atmosphere. For Wednesday’s mission, the Centaur made two burns – with the initial one lasting twelve minutes and 42.7 seconds. This established the vehicle in a transfer orbit from which a second burn, igniting half a second short of three hours later, injected the satellite into its operational medium Earth orbit. This burn lasted 86.2 seconds; with spacecraft separation occurring four minutes and 49.1 seconds after cutoff. GPS IIF-10 separated into a circular orbit at an altitude of 20,500 kilometers (12,700 miles, 11,050 nautical miles) and an inclination of 55.0 degrees. Injected directly into the GPS constellation, the satellite will take approximately a month to attain its orbital slot and undergo checkout before it is declared operational. Wednesday’s launch was the thirty-sixth orbital launch attempt of 2015 – including missions that failed to achieve orbit and February’s uncatalogued Vega launch whose upper stage achieved Low Earth orbit following a successful suborbital primary mission. AV-055 was the fourth Atlas V to fly in 2015 and the eighth launch of the year so far for United Launch Alliance. ULA’s next launch will come in just over a week’s time, with a Delta IV deploying a Wideband Global Satcom communications satellite. Atlas’ next mission is expected to lift off in late August, carrying a MUOS naval communications satellite while the next GPS launch will be of the IIF-11 spacecraft atop another Atlas in October. The final GPS-IIF launch is expected to occur in early 2016 and the first Block III launch is at present slated for the first quarter of 2017.